While strawberries and cream are a delicious way to serve a slice of angel food, decorating angel food cakes makes for a pretty presentation prior to slicing and serving. This light dessert is a wonderful alternative to more traditional decorated layer and sheet cakes. Whipped cream: Go with a plain whipped frosting or flavor it with extracts like almond, vanilla, peppermint or lemon. Choose one based upon the angel food cake flavor. Use a curved spatula to make small flourishes in the frosting for a pretty look after frosting the cake. Glaze: A simple glaze is a popular choice for frosting an angel food cake. Add your favorite extracts, liqueurs or even citrus zest for a delicious flavor. Use the back of a spoon or a pastry bag to randomly drizzle the glaze across the top of the angel food cake. Poured frostings: Poured fondant and chocolate ganache are delicious ways to frost an angel food cake, and they make frosting the inside of the cake's hole simple. Place the cooled cake on a wire rack over a baking tin covered in foil and slowly pour a light coat over the cake. Depending on the thickness of the frosting, it may be necessary to wait a few minutes and pour a second layer for adequate coverage. Buttercream frosting is a popular frosting for decorating cakes, but it may be a bit heavy for angel food cakes. Make sure the cake has cooled completely and frost with a very thin layer to crumb coat the cake. Allow this to set and then cover with another layer of buttercream, making sure to use just enough frosting to cover the cake. If you are planning a design for the cake that requires use of the entire top surface of the cake, it is necessary to cover the hole in the center. Cut a thin piece of cardboard out and cover it in parchment paper. Place over the hole and then frost as if it was part of the cake. For extra stability, consider adding a dowel or sturdy straw beneath the cardboard piece. Decorating angel food cakes for events or special occasions requires a little more than simply frosting the cake. Whether you choose to go with a simple garnished design or something more elaborate, make sure you are not weighing down the cake with too many toppings. Otherwise, the cake could start to bulge under the weight and potentially collapse. Stacking angel food cakes is possible, but be sure to use a sturdy system of dowels and cake plates, and wait until you arrive at the location before stacking them together. Even though these decorations are simple it is still possible to match them to the occasion. For a wedding or anniversary, top the cake with edible sugared flowers that are also in floral arrangements. At a birthday party, pipe colored dots in the same colors as the rest of the party decorations. Serve a chocolate Christmas angel food cake topped with green mint frosting and crushed peppermint candies. A themed cake design is another way of decorating angel food cakes, although somewhat more difficult. 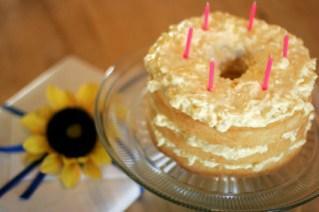 Virtually any fun cake design can be transferred to an angel food cake, as long as it is modified for weight and size. Pipe scrolling flourishes, licensed characters, flowers or even stripes onto the cake. Thin and lightweight pieces of rolled fondant are also helpful for creating a themed design; however, avoid placing heavy sculpted pieces on top of the cake unless you have additional supports added to the inside of the angel food cake. Decorations for an angel food cake are often simple once the frosting is on; however, intricate themed designs are also possible. No matter what type of frosting and decorations are on the cake, it is sure to be a sweet treat for everyone to enjoy.